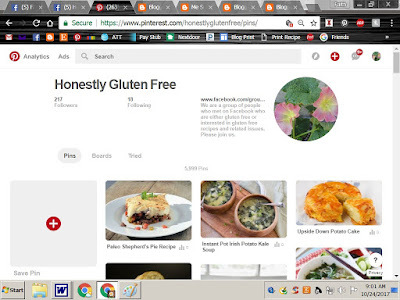 Open our Honestly Gluten Free Pinterest or any pin that you are interested in reading (tip - if you plan to open this a lot, bookmark it or place it on your desktop for easy access). 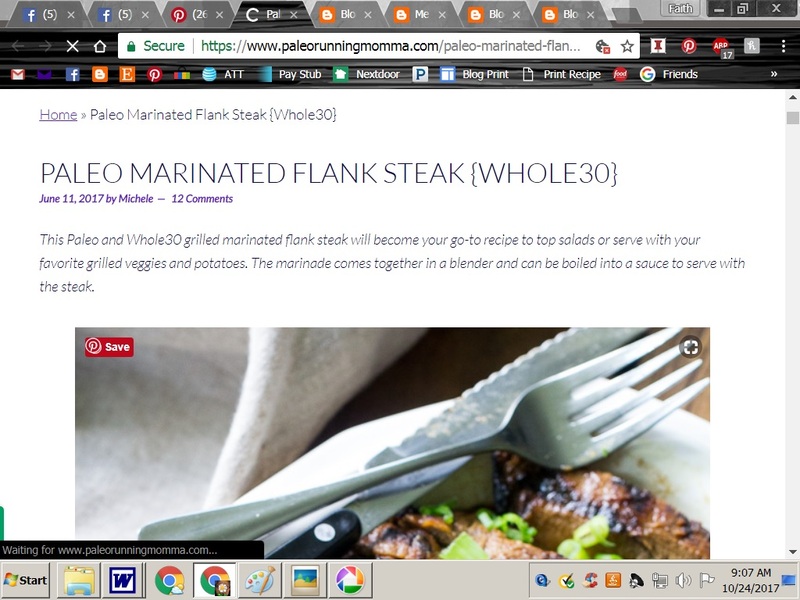 Search for a recipe or post you would like to look at. Today, we will look at this gorgeous flank steak recipe. Scroll down till you see "Make It" or "Read It" (see purple oval and arrow). 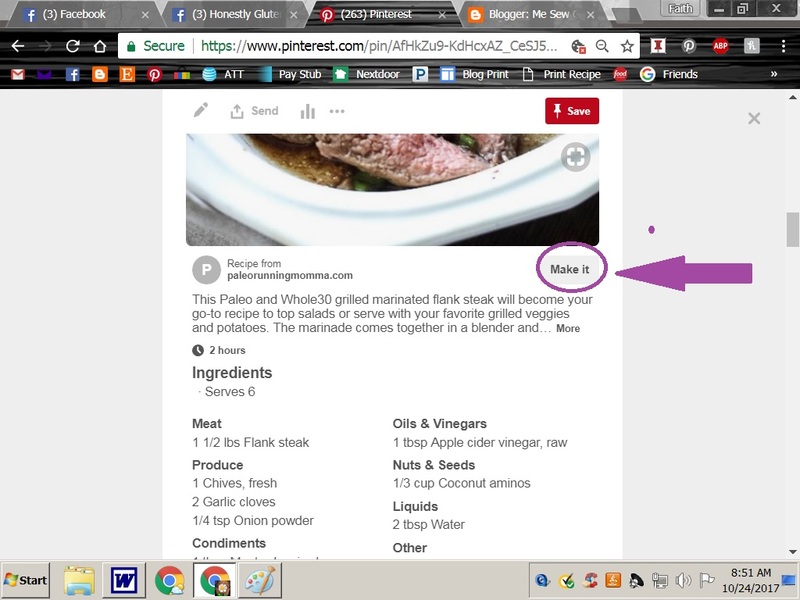 Click on that, then you can read, save, print or do what you want with that recipe. I hope this helps, if not, please let me know and I can go over it with you. I always welcome friendly critiques and comments or questions. I would love to hear what you think of this post or any of my other posts. Please feel free to leave a message here or email if you prefer. If you leave a message here, please be sure that your email address is sited so you can receive my response. Thanks! These recipes are for the members of Honestly Gluten Free. Non members are free to read and share these recipes too. 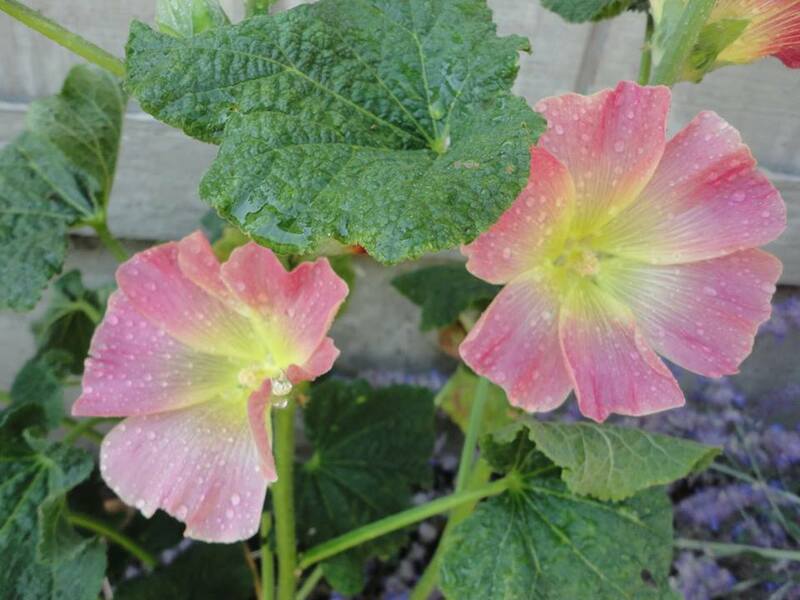 If you are interested in joining our group, you are more than welcome. We have our own Pinterest, where most of the recipes I share are pinned for members to access when needed. 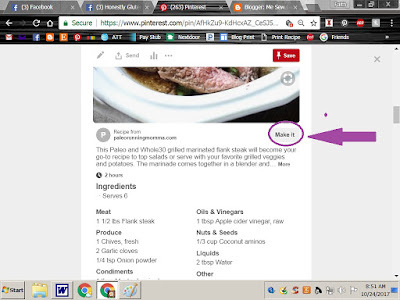 I have been gluten free since 2007, and in August 2015, I started a gluten free Facebook group to share recipes I have found. I am also dairy free, so I share recipes that allergy friendly for those who are. I decided to round up some allergy free recipes for the holidays. I have included edible gifts and cookies for those who may need a gift or who are going to a cookie exchange. More recipes can be found on our HGF Pinterest - feel free to look at other recipes that may be of interest to you. I would like to take a moment to thank all the members of my group. We are slowly growing, and hopefully in 2017 will grow even more. I wish you all have a great holiday season with your family and friends. Thank you for letting me help you find good things to eat. I hope we all have a prosperous and Happy New Year!! I always welcome friendly critiques and comments or questions. I would love to hear what you think of this post or any of my other posts. Please feel free to leave a message here or email if you prefer. If you leave a message here, please be sure that your email address is sited so you can receive my response. Thanks. 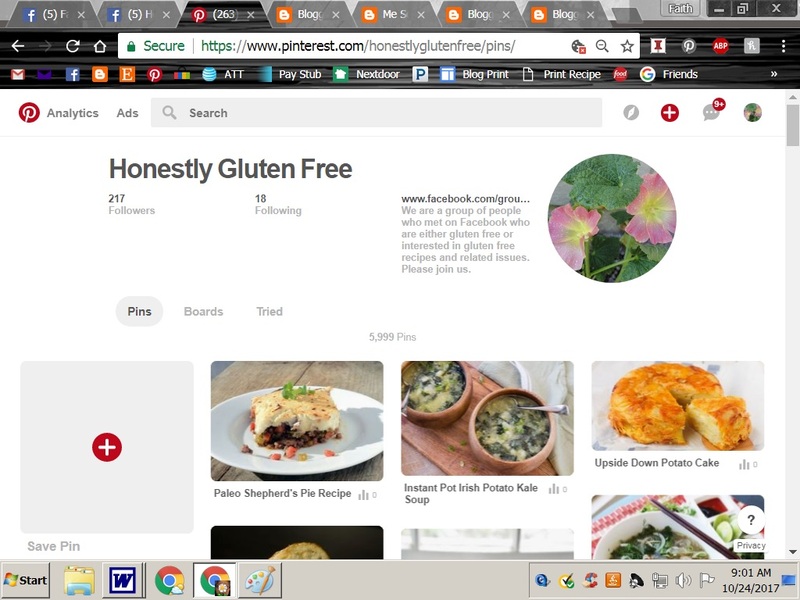 I have been gluten free since 2007, and in August 2015, I started a gluten free Facebook group to share recipes I have found. I am also dairy free, so I share recipes that allergy friendly for those who are. I decided to round up some allergy free recipes for Thanksgiving for those who may need an idea or two. I am thankful for my Honestly Gluten Free group and all my friends there. I Hope everyone has a great Thanksgiving with family and friends. P.S. I am planning to do this with Christmas recipes and also for edible gifts that would be suitable for anyone. Eggplant was on sale at my grocery store. 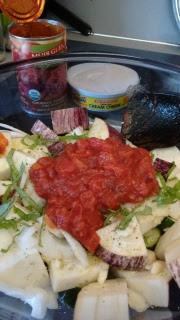 I love eggplant, but not at the high price it costs, so whenever it's on sale, I buy it. 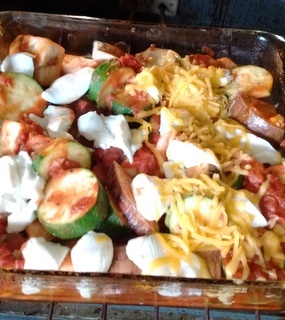 I was craving a kind of ratatouille recipe and thought I could make my own. I looked at several recipes to get ideas, and made my own. Large drops of dairy free cream cheese. Half way through baking, added some cheddar on the right side. Dairy cheese always goes on the right side in my house. 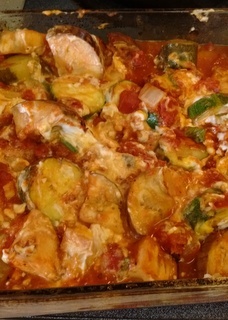 Zucchini and eggplant cooked in fire roasted tomato sauce for a scrumptious main meal or side dish. 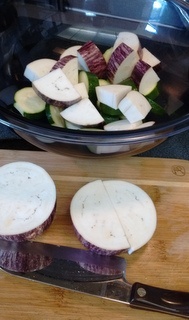 - Cut all the veggies about the same size for even cooking and place in a large bowl. - Mince the garlic and add to the veggies. - Chiffonade the basil and add to the bowl, along with salt and pepper. - Next add the EVOO and mix everything together. 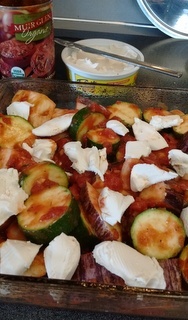 - Add some large drops of cream cheese all over the top. - Take a piece of foil large enough to cover the dish, spray with cooking spray to prevent sticking. - Bake for 1/2 hour with foil on, then another 1/2 hour with foil off. Can add optional cheddar at this point - I only put it on one half since I am dairy free. I hope you try my recipe. If you do, Please let me know how it came out. Labels: Dairy Free, Egg Free, Gluten Free, Gluten Free Recipes. But one thing I can do better than anyone else . . .
That is to be ME!